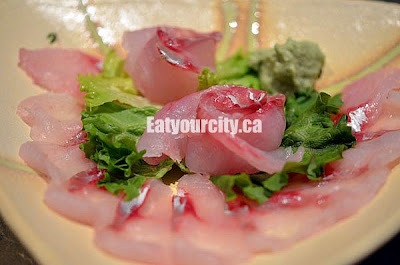 Eat Your City: Sushi Wasabi Edmonton, AB - gorgeous and delectable Sea Robin and nigiri! Sushi Wasabi Edmonton, AB - gorgeous and delectable Sea Robin and nigiri! Rating 10/10 We have an insatiable appetite for Japanese fare. We admit it, but it taste sooooo good! And with all the omega 3's, its good for you too! 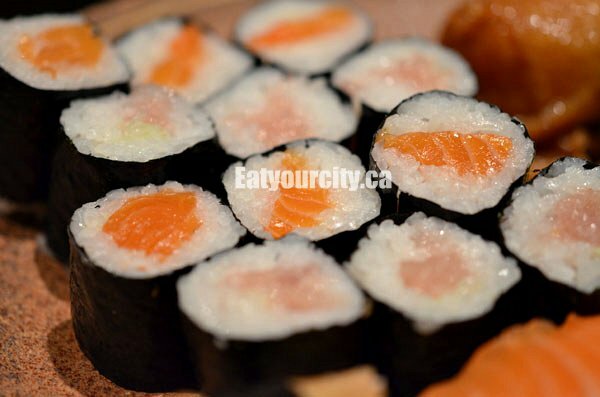 After a long day at work, we deep sixed making supper for another night and head out to our favourite sushi joint - Sushi Wasabi! There's a few specials on the blackboard tonight including tako-wasabi (diced fresh octopus marinated in wasabi) - we haven't had this since Tako-No-Ki in Honolulu! Something new too: sea robin - normally used as a substitute to rascasse/scorpionfish, in bouillabaisse (a type of French seafood soup), and generally hated by anglers since they love to steal bait right off your hook! True to form, the Chef at Sushi Wasabi serves the sea robin is three different ways... mmm! Service is fast with additional staff both in the kitchen and in the dining room. Food came out within 10min! We start with little cubes of fresh raw octopus marinated in a wasabi based sauce. 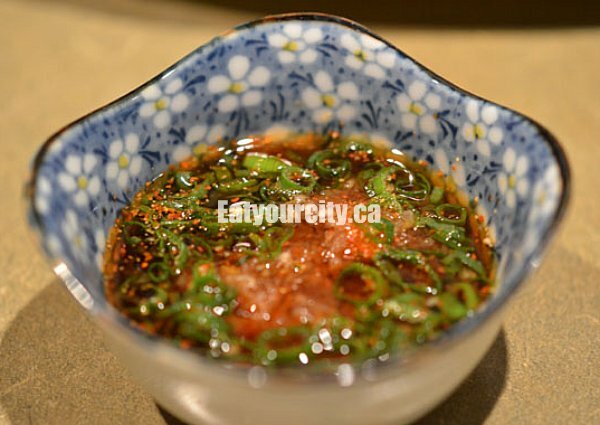 The slight sweetness of the firm yet tender octopus is enhanced by the spicy freshly grated wasabi.. until the wasabi starts clearing out your sinuses! heehee... tasty and fun to watch other's eat it. 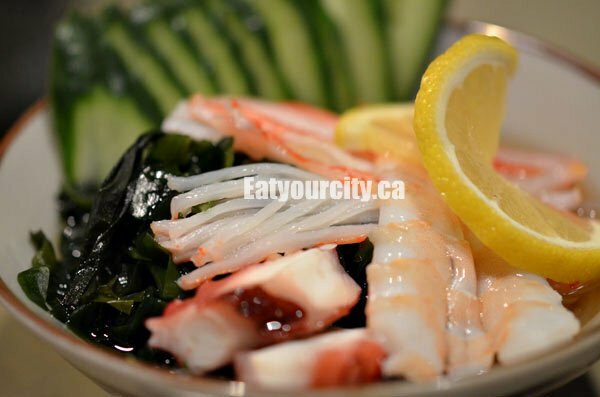 Lightly blanched pieces of octopus, shrimp, crabmeat, kelp and cucumbers sit atop a bed of clear vermicelli noodles, all swimming in a perfectly balanced tangy rice vinegar based vinaigrette. Nom! 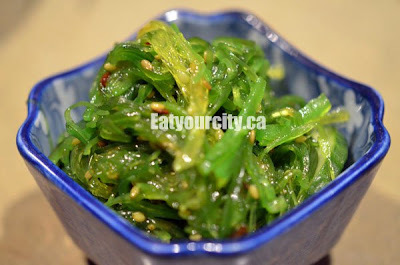 I'd be remiss if we didn't order this tasty and addictive seaweed salad flavoured heavily with a tangy and spicy sesame oil dressing and garnished with toasted sesame seeds and cucumbers (hiding at the side-bottom). Mmmm. 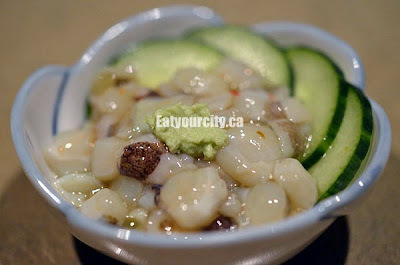 I'm still waiting for the day they serve a BIG bowl of this awesomeness. Nom. Sliced so thin each piece is translucent and arranged beautifully in a flower shape. 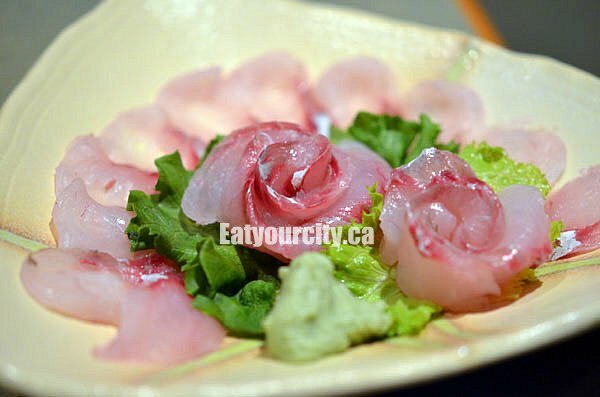 This medium firm sashimi has a pearly luminescence to it, and one of the sweetest fishes we have tried so far and its so tender sweet. The belly pieces are more sweet, while the back pieces have a more pronounced flavor. Mmmmm! So pretty, almost too pretty to eat.. almost! I know, its not a dish per say, but this yummy house made addictive and tangy ponzo sauce loaded with grated diakon, toasted sesame seeds, garnished with slivered green onions and a hit of chilis is perfect for dunking in the searobin sashimi back pieces. Nom! 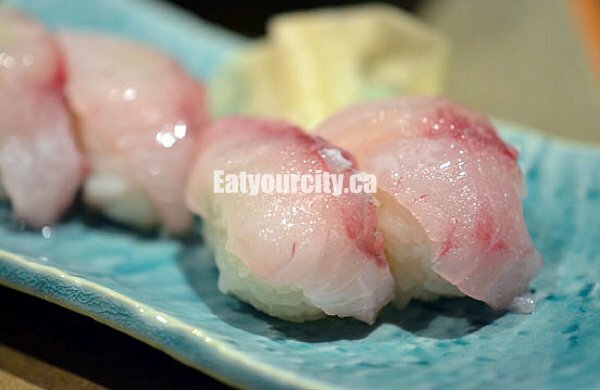 Normally, we prefer not to have lemon anywhere near sashimi or nigiri - even as a garnish as the lemon kills off subtle flavors. However, we were pleasantly surprised with these Sea robin nigiri. Lightly brushed with fresh lemon juice and a trace of fleur de sel, the light kiss of lemon and salt instead brings out the delicate sweetness of the Sea robin and really made it shine. Nommy! Since we always order tekka makis, we decided to have some salmon makis as I was craving salmon :P Cool, sweet and creamy salmon balanced with well seasoned and well made sushi rice (an art to itself), the salmon makis disappeared in a flash. The tekkamaki were incredible tonight as the tuna was so fresh and creamy buttery, it just melted into your mouth. Mmmm! Hey, I did say I was craving salmon... and the salmon nigiri was delectable! 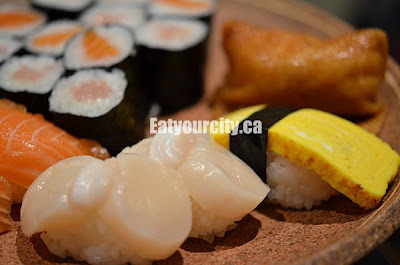 The scallop nigiri was fresh and sweet with just a trace of freshly grated wasabi... 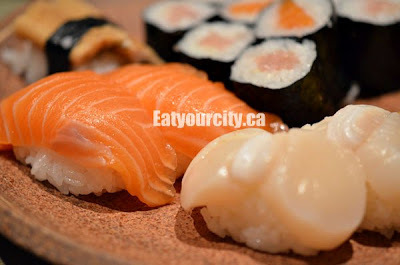 I think the Chef noticed my eyes watering a bit with a previous bite of nigiri that decided to visit my sinuses along its route to my tummy.. and smothered a giggle. Yumm! My boyfriend had one of his favs - thinly multilayered sweetened egg nigiri, and we shared the Inari - a tofu envelope braised in a savoury sweet sauce with a nugget of seasoned sushi rice inside. Salty savory sweet goodness! 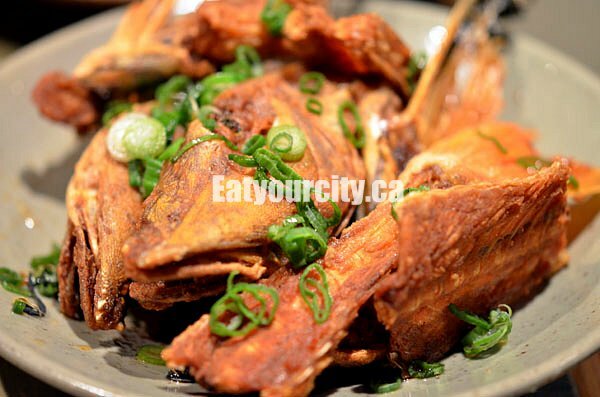 Now after a plate of sashimi and nigiri, the fish head and bones are fried to a crisp so you can eat the deep fried bones seasoned with a bit of fleur de sel and ponzo sauce. Light and crispy, these are better than potato chips! Now in the last decade or so I've had many delicious meals at Wasabi, I've never had room for dessert. Tonight that changes, as we've held off on ordering more food to save the all important tummy room for dessert! We decide to skip the inhouse made coffee jello and grapefruit jelly (though it was my second choice) and try their pineapple sorbet filled mini pineapple. 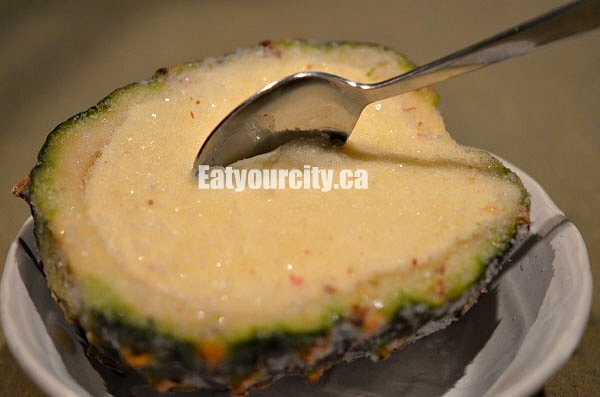 Yes, mini pineapple - its about the size of your palm, scooped out and filled with a light and refreshing pineapple sorbet. Afterwards, we chiseled some of the frozen mini pineapple to eat - very light and sweet. A great way to top off a great meal. Overall, still the best Japanese restaurant in Edmonton in terms of consistency, quality of the sashimi, attention to detail and superb knife skills. And now with more staff on hand, the service is super fast too!